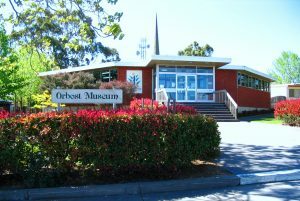 Founded in 1967, the Society maintains a MUSEUM IN RUSKIN STREET, ORBOST where the majority of the collection is stored and displayed. This Museum is co-located with the Orbost Library in East Gippsland Council’s Business Centre and is open from 9am-5pm weekdays. We also have an extensive collection of PHOTOS. We maintain an active interest in the historic SLAB HUT (Orbost Visitor Information Centre) and its surrounds which include several wagons and a water wheel and gold stampers. The SLAB HUT also contains items from the Historical Society’s collection. Behind the Slab Hut is THE SHED (with an open grille front) where farm and ‘shed’ type items can be viewed. MEETINGS are held on the first Monday of once a month (except December and January) at 2pm in the Library Meeting Room, Ruskin Street. All members regularly receive our NEWSLETTER and MINUTES which are mailed to them. Members contribute their research to our Newsletters which are excellent small publications on local history topics. These can be viewed in PDF form as NEWSLETTER PUBLICATIONS on this website. The Society also produces a number of BOOK PUBLICATIONS. We hold THEMED EXHIBITIONS AND DISPLAYS in various locations including in vacant shops, at the Orbost Exhibition Centre, at the Orbost Agricultural Show, and at the Regional Gallery at Bairnsdale (as part of the Heritage Network of East Gippsland).